Nowadays it seems like a lot of people take all sorts of supplements whether it be to help with muscle growth, muscle fatigue, muscle recovery, or just general health maintenance. Not to mention more people are using supplements for their health rather than going to the doctor and getting prescription medicine which is a good thing. It is way better to be healthy than to be sick in ill health. It’s no secret, some people take better care of their bodies, minds, and overall being than others. So the average person may ask, how do I get better at being a healthy person? Or, how can I build my body into better shape so I can be good looking when I’m an old man or woman? Well one secret step that some people take in order to get into better shape or more fit whether it be Mariusz Pudzianowski style, or just your typical fit person who just looks well all the time, is to take some muscle building supplements. Muscle building supplements are used for both fuel and recovery. By utilizing muscle building supplements it can help you achieve an edge on your competition, however with that said, I don’t believe that all supplements are completely necessary to maintain a healthy body. A lot of healthy people get really cut and fit by just diet alone and having a strong balance of whole foods. So with this post, you don’t have to 100% take my advice, but if you would like to become a lean, mean, green machine it helps to take a periodic supplement or go through cycling of certain formulas on and off. Doing so in the correct order can help your body become more sculpted and strong like a piece of art. With C4 I really feel immediate results as my motivation, endurance, and power is enhanced. I believe this is in large part due to the large amount of Beta Alanine in this product. Beta Alanine is a strong non-essential amino acid that helps with endurance and defeating fatigue during workouts so more repetitions can be accomplished. The main effort in any workout is to become focused and driven towards gaining growth, which I definitely feel with this product. I’ve noticed that, whether utilizing weights or doing resistance exercises Beta Alanine helps me tremendously, and it is extremely helpful if you’re a vegetarian or you fail to eat a lot of meat. The main property Carnosine which works with Beta Alanine is what does the most help in enhancing endurance. Another great non-essential amino acid present in this formula is Arginine AKG, which stimulates more lean body mass, less pain, and less stiffness during a workout. Arginine AKG is also known to help prevent sterility in men. One of the last things I generally love about this product is the high dosages of B vitamins and vitamin C, which add a nice little boost of energy as well to your workout. C4, the well-known product sold by the supplement giant Cellucor is a great product as it shows results and helps you perform strongly in the gym. Despite the results it has some cons that I would like to mention. Personally it falls short in a couple of areas, one being that it contains a lot of artificial ingredients and unknown patents that provide a boost within the workout room, but may be hurting the body with the chemicals. I prefer to stick with more natural ingredients and less fillers, so seeing artificial colors like Red 40, and Sucralose (an artificial sweetener) provide some worry. I feel that these particular ingredients sway health experts away from this product, because of the lack of better quality substitutes such as beet red as a color dye, or stevia as a natural sweetener substitute. So for me personally, perhaps if these ingredients were changed I think the product would be substantially better and more appealing. I feel as if C4, would attract a much larger crowd to their already dominant line of products if they took certain ingredients out of their recipe and focused on the more natural whole food culture ingredient wise. Besides those ingredients I don’t have much more critique. C4 can be bought here! 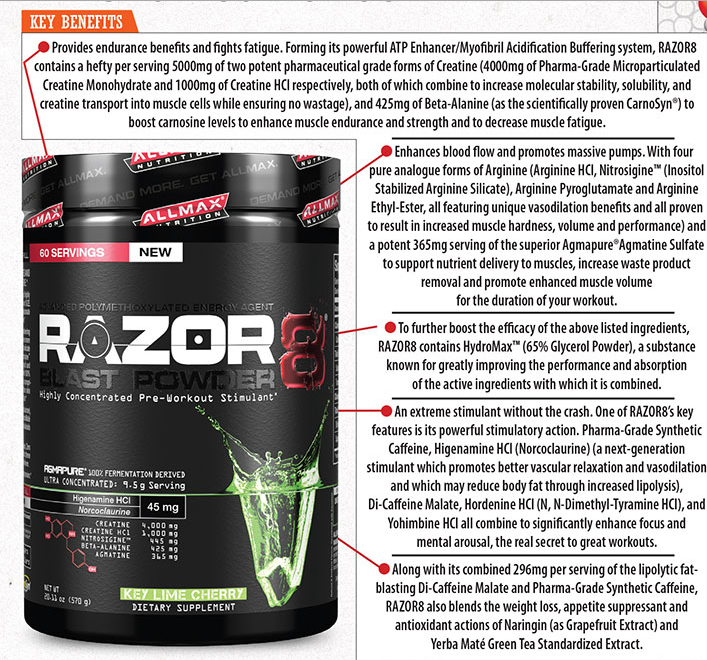 Razor 8 is a supplement on the market that I like mainly because it has less filler ingredients, artificial colors, preservatives, and unknown secret ingredients. With the All Max Razor Eight, you are getting a superior product, with two forms of Creatine and natural body fat trimming ingredients it makes for an interesting blend. The powder is rather easy to mix with water and it tastes more natural with less chemicals involved. There are less filler ingredients in Razor 8 than the counterpart C4, as well as no artificial dye coloring, which is a major plus. Razor 8 also doesn’t include aspartame a dangerous ingredient linked to cancer and brain damage. The use of Green tea, Yerba Mate, and Grapefruit extracts is wonderful, as they are naturally derived and serve a great use in trimming body fat. The Green tea, Yerba Mate, and Grapefruit formula also helps curb appetite in order to help one achieve a more cut and ripped body frame. Another benefit that I’ve noticed is that Creatine in combination with caffeine can help improve focus and overall mental clarity for learning as well. This however, also could be due to exercise in general, which is related to increased neural functioning in the brain and improved academic performance. With All Max Razor Eight I do have a few set backs. One set back is due to the use of Synthetic caffeine and the other being the use of some a pharmaceutically derived ingredients which are made in a manner that causes suspicion. The use of Yohimbine for example is both interesting but at the same time, it must be monitored. Yohimbine increases blood flow dramatically through the body, so it should be taken in low dosages, as it can aggravate high blood pressure or aggravate psychological problems. Due to the different side effects depending on the person, I’d advise one to take lower doses in order to figure out how your body may respond to this particular mixture. Razor 8 pre-workout formula can be bought here! Overall, these are both formulas that work well, but be careful and assess your tolerance first. Everyone’s body chemistry is different. Also, if you have worries contact your doctor, or medical professional about what supplements support you best. Freedman, Lisa. “Supplement Guide: Beta Alanine.” Men’s Fitness. America Media, Inc, n.d. Web. 05 Mar. 2015. <http://www.mensfitness.com/nutrition/supplements/supplement-guide-beta-alanine&gt;. “Yohimbe: MedlinePlus Supplements.” U.S National Library of Medicine. U.S. National Library of Medicine, 10 Oct. 2014. Web. 05 Mar. 2015. <http://www.nlm.nih.gov/medlineplus/druginfo/natural/759.html&gt;. 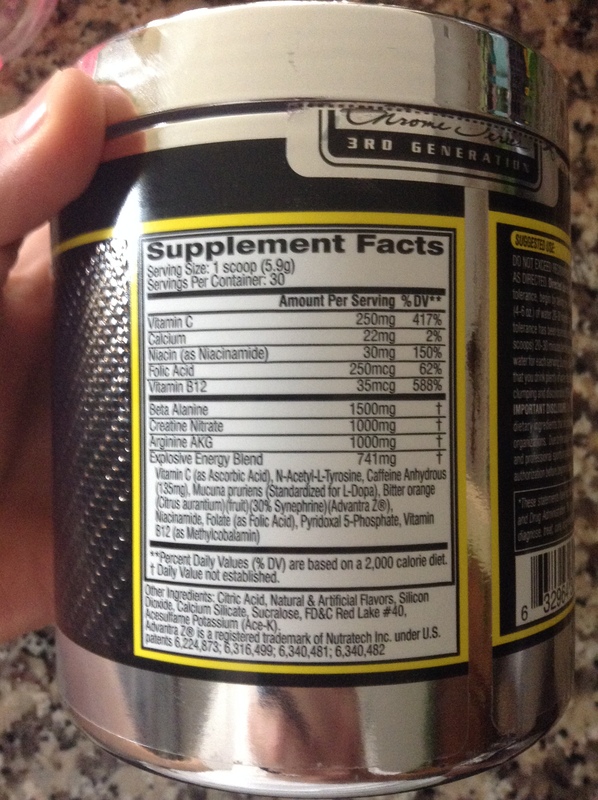 This entry was posted in Health & Wellness and tagged Beta Alanine, muscle building supplements, Pre-Workouts. Bookmark the permalink. 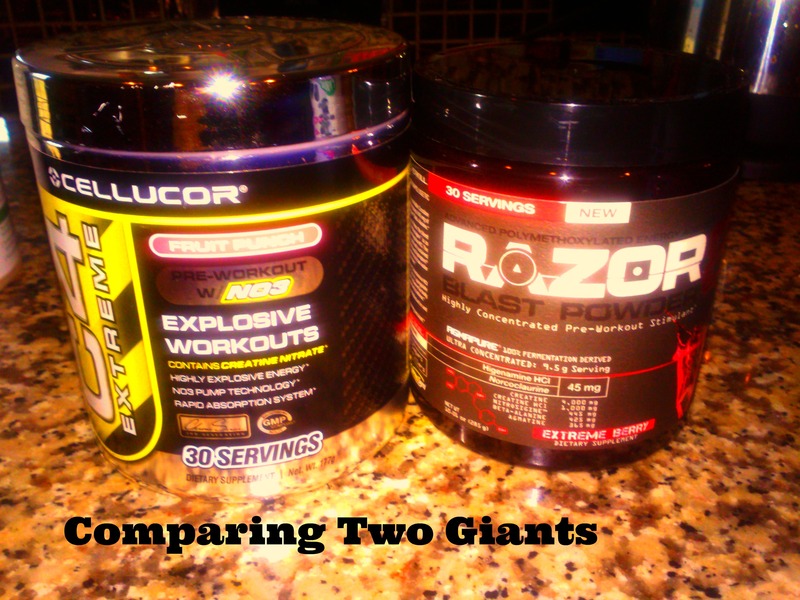 can i use Razor 8 blast powder with L-Glutamin and Whey protein? Yeah Aziz, I would use Razor 8 before weight lifting exercise, then combine L-Glutamine with Whey protein post exercise. The way whey and glutamine ingredients work biochemically is more through protein synthesis and assisting gut enterocytes.